Owning a pool at home is a luxury dreamed of by many that exists for a few. Pools obviously suit homes where the climate is warm, but they are also perfectly suited to colder parts of the world. By owning a pool indoors, we are able to utilise the many benefits of owning a pool year round. Swimming is a great way to start or finish your day, to wake up or relieve stress. Swimming is also the perfect form of exercise, utilising all muscles of the body, with absolutely no impact on joints. It's for this reason swimming and hydro therapy have been used for many years as a form of rehabilitation, to get the body moving again, without the risk of injury due to impact. Indoor pools have been around since the Roman era, and pools of this time can still be found in European cities today. Washing and staying clean was part of the daily routine for the Romans, and the bathing houses found across cities of the Roman empire were not only a place to cleanse, but a place to interact and socialise. The Japanese have also enjoyed indoor bathing for many centuries, bathing in onsens, very hot bathing pools that are still an essential part of the Japanese people's daily routine and culture. 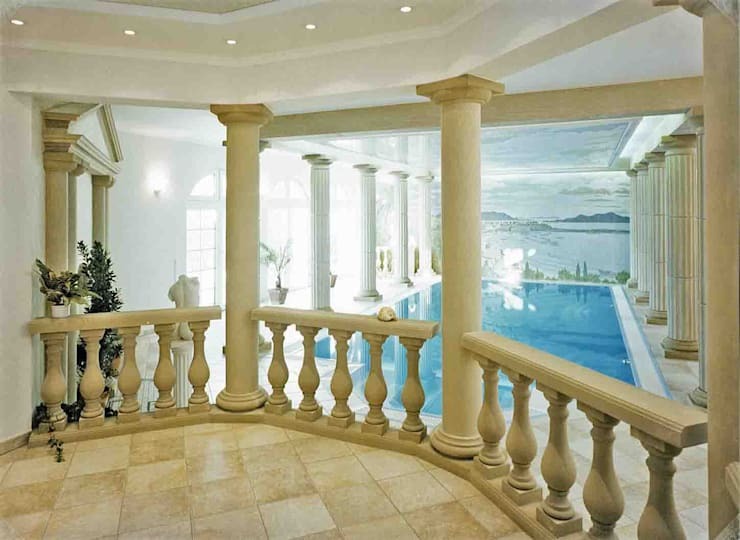 With so many reasons to own an indoor pool, here are some fine examples of indoor pools, from the extravagant to pools solely for exercise. 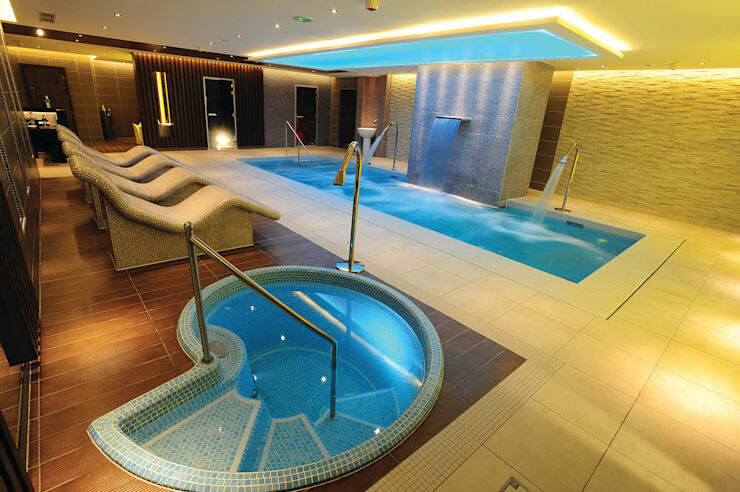 This pool is a beautiful rendition of how an indoor pool should be. Amazing blue hues of light tucked into the facades above, with a poolside lounge seating area that is great for entertaining or relaxing. The down lights add a perfect match to the blues above. Notice the floor of this room is slightly slanted towards the pool, a smart drainage system for a space that will obviously get very wet. The ultimate in home spa decadence, this fine example of indoor pools comes with all the accessories for the ultimate home spa. The pool, with shower heads for massaging, waterfall-style water feature, spa bath, steam room and sauna are all styled with great lighting. One could imagine spending hour after hour in this amazing relaxation room. 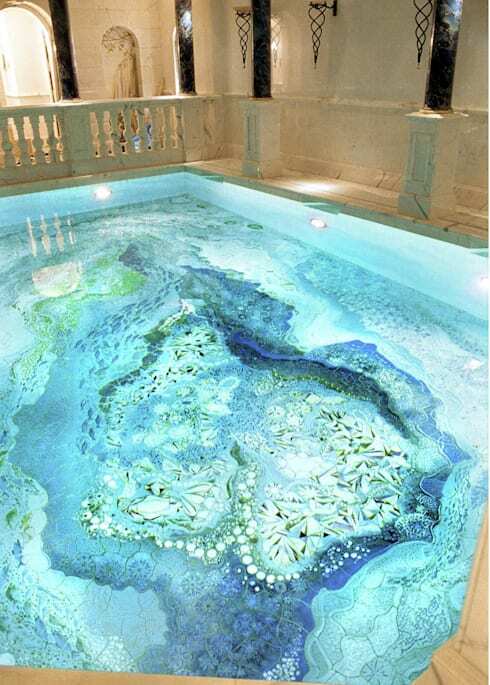 An interesting and unique design for a pool bottom, this pool from the London Swimming Pool Company draws inspiration from a tropical reef, complete with a design resembling coral and schools of small fish swimming around. 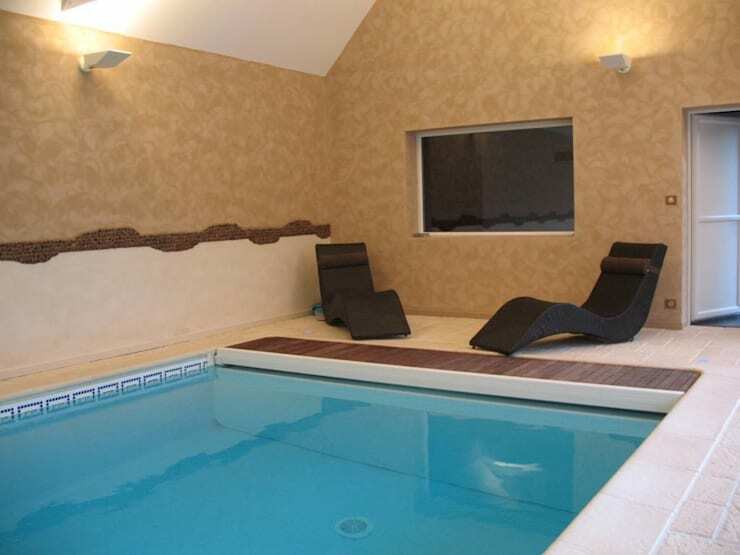 Click here for more great designs from the masters at London Swimming Pool Company. 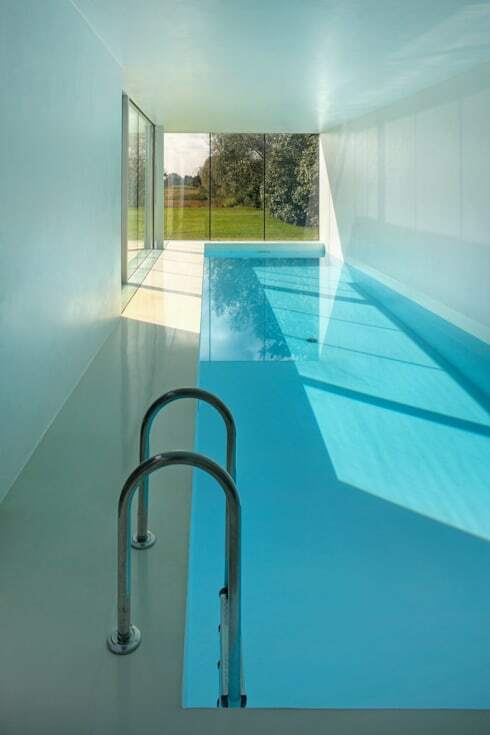 The shape of this pool tells us the owner of this home has installed this pool for one reason—to go fast. This beautiful lap pool is long enough not to feel like you would be forever tumble turning and has great natural light from the floor to ceiling glass walls at the far end. A little natural light would make this pool a little easier to dive into early at sunrise, the time of day optimal for swimming training. As mentioned earlier, Roman baths have been around for many centuries. This Roman-style setting is a great example of traditional Roman architecture, with the large round pillars lining the side of the pool and the Roman-style fencing facades in the foreground. A Turkish bath, or hammam, is the Turkish variant of a Roman bath. Although the acts of soaking and rinsing were relatively similar in both variants, the difference was the décor. 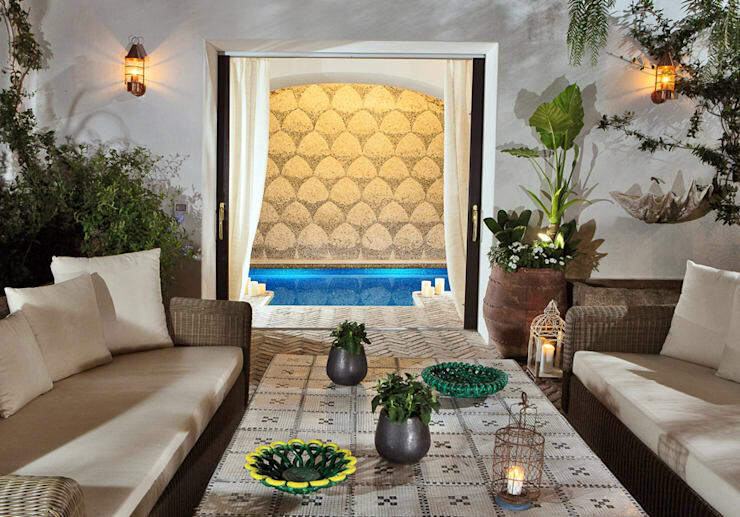 This modern take on a hammam has been decorated as hammams traditional were, with patterned walls and mosaic tiles, with a touch of green and some modern couches. Why not add a large flat screen to your poolside setting? What better place to watch the football during winter than in your heated indoor pool with some friends around, beer in hand. 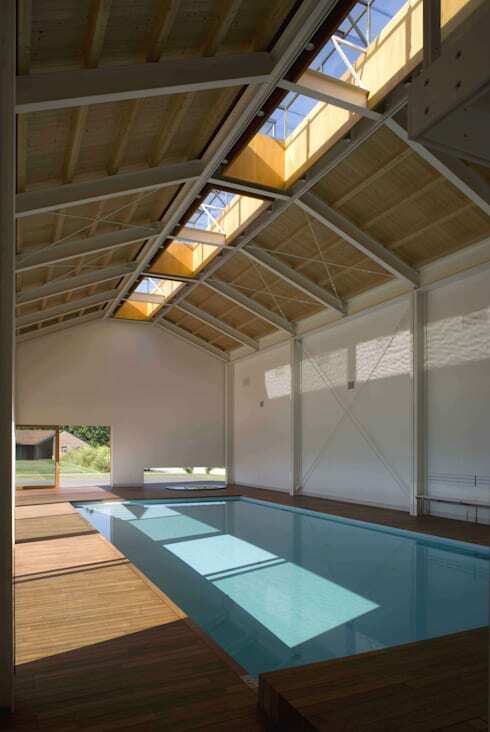 Yet another take on the indoor pool, we see this barn used to house this indoor pool. With the skylights above, and glass walls to the side, ample light is available to swim at all times of the day. We love this downstairs pool with access from the second floor of the home with blue spiral staircase, perfectly matching the blue hues of the pool it leads to. 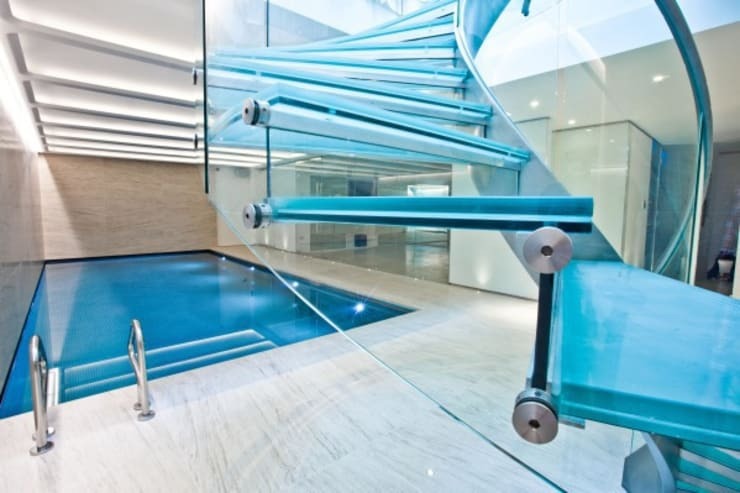 The pale blue of the stairs with its glass structure perfectly mimics the tones of the pool and the colours the rippled water creates. Traditionally outdoor and indoor pools have been painted in blue tones. 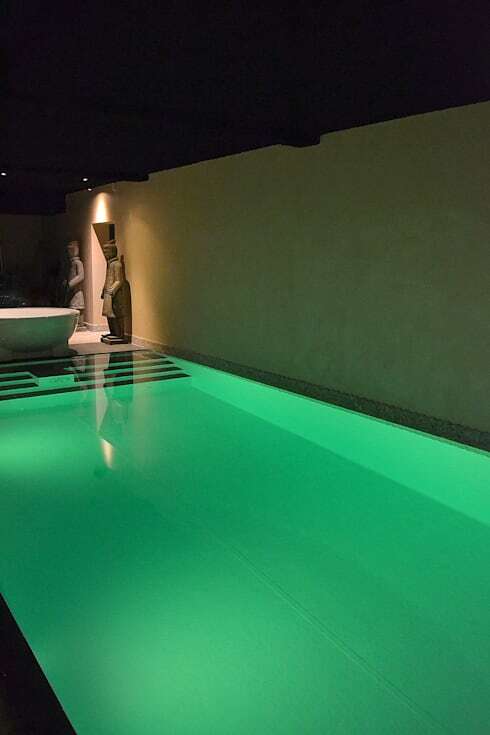 As this example shows, green is also a great colour to use to light up an indoor pool, presenting a more relaxing tone.